We require a non refundable deposit on portrait sessions at booking (wedding deposits are a percentage of the total package). This will be put towards your session package. 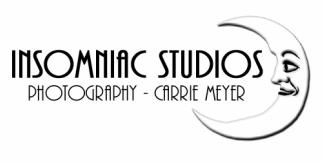 Please contact Carrie directly for pricing via this webpage or email at: carrie@insomniacstudios.net. On-line proofs available for you to view within 5 business days from the shoot. View our helpful tips on family portraits here and for senior portraits here. View our helpful tips on pin-up/boudoir portraits here. I am not a traditional wedding photographer, so if you are looking for that, we are not the studio for you! However, if you are planning an off the wall and really different wedding, I would love to talk to you! Have other needs? Just contact Carrie for a custom quote! If you are interested in pricing on mounted prints, gallery wraps or any other specialty item, just let me know!